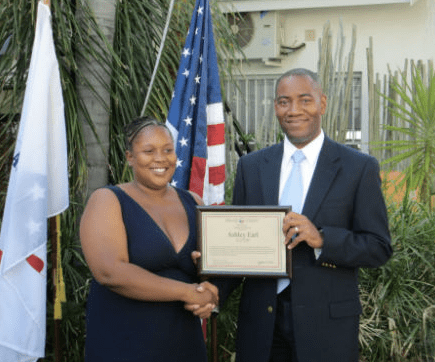 WASHINGTON, D.C., March 10, 2014 – Peace Corps Acting Director Carrie Hessler-Radelet is saddened to confirm the death of Peace Corps volunteer Ashley Earl. Ashley, 30, passed away in her host community of Oshakati, Namibia on Saturday. Ashley, of Kent, Wash., entered service as a Peace Corps volunteer in Namibia on March 13, 2012. Since that time, she has been serving as a community health volunteer, working with Catholic AIDS Action and coordinating after-school activities for youth in her community of Oshakati, in northern Namibia. A graduate of Central Washington University, Ashley earned a Bachelor of Arts in law and justice, and in sociology, as well as a master’s degree in social work from Eastern Washington University. Her commitment to service began prior to joining the Peace Corps, as she served for six years in the United States Army Reserve, and worked as a visitation facilitator at the Spokane, Wash., Child Abuse network, at the Women’s Studies Center of Cheney, Wash., and at the Veterans’ Coalition of Ellensburg, Wash.
Ashley was an avid reader with a thirst for knowledge who also enjoyed watching movies, doing needlepoint and exercising in her spare time. She is survived by her parents, Phylliss and Lee Lundquist, and her beloved sister, Stacy Earl, in Washington state. I went to grad school with Ashley, she certainly was a very strong woman and greatly missed, until later my friend. I miss you still, very much. Thanks for your hard work. Rest in peace.